Damfino. How heavy is that rock Bill? Specific gravity more or less. Gotta have more than streak to ID that rock. With nothing but streak to go on I would call it magnetite. Can you scratch it with a knife? I would say it's magnetite also. But I have never seen any with that type of "crystallization". Will not scratch with a knife and very heavy. Keep the thread going.... an easy one. Hope everything is going OK with you. Not posting as much as you used to. 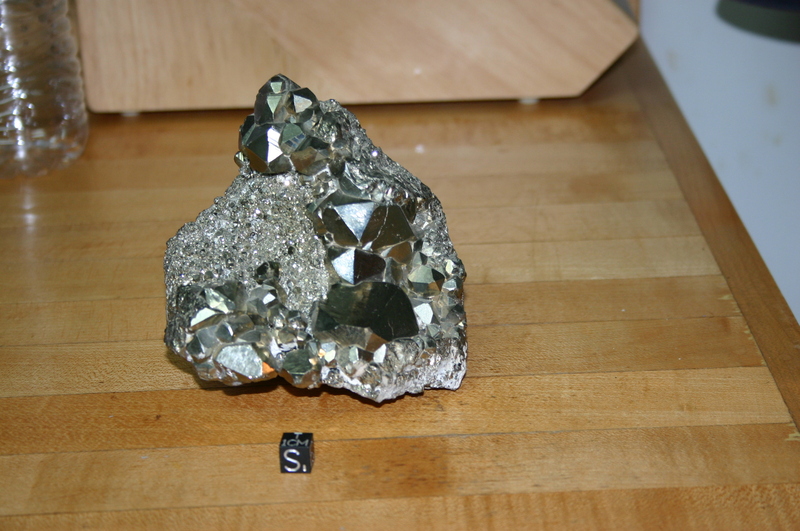 The first one is pyrite. My guess on the second one is mimetite. Hard to get a close up of the crystal structure... More or less went by the color... second choice would be vanadinite. The third one looks like galena. Yes, the 1st one is Pyrite. A really nice specimen. And the last one is Galena, another nice specimen. One hell of a heavy piece. But as for the 2nd one, I have no idea. But I can tell you now if you don't pick it up from it's matrix base, it's like picking up a cactus. Those crystals will penetrate your skin and it's a heavy piece coming in at 5 lbs. It was given to me without any information and I really would like to nail it down. Here's some more close ups for you to ponder over. Sorry to hear about your troubles. We all go through those every once in awhile. I've been going through some myself lately. Just hang in there and I'm sure everything will work out OK in time. My specimen is not so spectacular, but same mineral from AZ. Azurite. That was too easy. Nice photo of the specimen from Morocco. Not much to go by on this one colorwise- but I've got a hunch. Going to say smithsonite. If not I have another mineral in mind. Thanks for all your input. I will see what else I can find in my box of trinkets, they might not be spectacular and an easy ID but this is a great thread and needs to keep going. I might even take a picture of my waterfall, it's 6 foot high and believe it or not made up of rocks that I'd picked up in the desert. The vertical walls of the waterfall is done in sliced rock containing fossils. Who knows, I might have a fortune in that waterfall... Yeah right. I have no real clue on it and don't remember where I even picked it up. Have allot of mineral specimens gathered over the years visiting old mines etc. Is it heavy for its size? That's a clue for a lead mineral. If so, my first choice would be smithsonite, then cerrusite. Actually not heavy at all... For it's size anyway bout what you would expect.